NWE moving gas in Clark today and tomorrow, Contractor working on water rehab in Clark Street, should finish today. Plan to be working on sewer in Clark next week. When will Main Street be closed? Estimated to be early MayContractor will maintain pedestrian access to downtown at all times. Mob and set up systems, start saw cutting. Then move to utility improvements in Clark Street, 3-4 weeks. Sidewalk removal later. WMC will install gravel and maintain business access during construction. Week of 4/1/2019: Contractor to mobilize and set up traffic control. First thing the contractor will saw cut sewer trench in Clark from alley to B Street.Contractor plans to start replacing utilities in Clark Street starting on the east side and working west. There will be a link to construction schedule and traffic control plan on the project website. TD&H has completed a project website: improvelivingston.comDelivery coordination through Steve R. (WMC). Clarification that alleys are open for deliveries and parking. WMC will maintain access to alley traffic when the streets are closed and will work with businesses on deliveries etc.Project signage – business input for signs – content and locationContractor will maintain pedestrian access to downtown at all times. No more public meeting scheduled for this project. Please follow the website and City Facebook page for updates on anticipated schedule and traffic control. 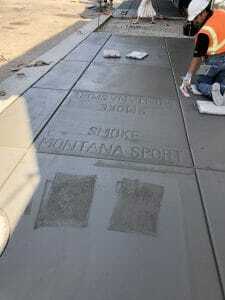 Paving underway, should be complete by Thursday morning. Streets will be open for the weekend starting on Friday. Pavement and curb painting is scheduled for August 6th & 7th. Streets will be closed during striping for these two days. Weekly meetings on Wednesday at 8:30 am are moving to the Pickle Barrel starting on July 11 due to a scheduling issue. End of week or early next week finish demo work in Callender. Lewis is next for demo. Ideally, COP is finished with all demo by end of June, weather dependent. Electricians have started work in Callender behind demo. COP will continue to maintain trench gravel crossings and will no longer work through rain events, not worth the trouble. The alley between B Street and Main is Phase III of this project and will have conduit installation, prep and pavement. COP will maintain access during conduit installation and will coordinate access during pavement preparation and paving operations. Art walks are on Thursdays and Contractor is aware of these events and will have the work area cleaned up after the work day is finished. Demo started at 2nd and Callender, pipe is done with exception of one water service at the firehall building Weather is wet and create messy conditions. Contractor is maintaining trench gravel to minimize rutting and maintain intersection pedestrian crossing. Done with pipe this week, start demo in Callender next week. COP and TD&H will be working closely with each business to coordinate work. Project is on schedule. COP will finish pipe this week and open Main Street and Lewis Street over the weekend. Callender between 2nd and B Streets will be closed during demo work, approximately 2 weeks. The curb and paving crews will come in behind street demolition. COP will maintain trench gravel on Main Street and Lewis Street during demo work on Callender. COP will introduce a new project superintendent next week for the street work. Several of the businesses expressed that they would like to be contacted ahead of work in front of their location. They are encouraged to get phone numbers of the City, TD&H or COP personnel and the team will work together to provide all the information possible. Change in conditions on the project – concrete under asphalt throughout project limits. COP will saw cut asphalt and concrete and remove material in trucks. Weather last week and forecasted for end of this week may slow progress. This week is water in Callender. Completing the connection to existing main in 2nd and Callender today. A second crew is likely mobilizing to the site next week to start on water in Lewis. After water improvements, COP will focus on street and sidewalk demolition, storm drain improvements and then rebuilding the road and sidewalk in Lewis and Callender before moving over to Main Street. If businesses can communicate deliveries ahead of time with City and Contractor, that would be appreciated. Signage off Park Street is confusing and deterring business. COP will move signage back off Park Street to encourage traffic to turn in and will hang banners to communicate businesses are open. Horse ring has been donated to the project to replace the stolen item in front of the Mint. Other historical items have been painted to alert public of items for salvage and reinstallation on the project. Pulverize asphalt, blade millings and roll for entire project limits. Then move to utility improvements in Callender Street, 3-4 weeks. Sidewalk removal to be simultaneous with utility improvements. 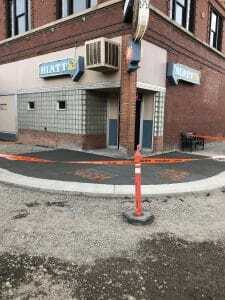 Directly after sidewalk removal, COP will install gravel and maintain business access during construction. Hitching ring has been removed outside the Mint. This preservation item was identified in the contract to be preserved and installed in new concrete. Matt W. called in a police report to investigate. Matt W. will also report this incident to the Enterprise. Delivery coordination will go through Steve R. with COP. Concern that traffic is not heading the stop signs in the construction zone. TD&H will put a warning on the project website and Matt W. will inform the police department of the traffic violations. Project signage off Park Street is confusing for traffic and they are avoiding the first block off Park Street due to current signage. TD&H will look into options to improve communication for traffic control off Park Street. Clarification that alleys are open for deliveries and parking. COP will maintain access to alley traffic when the streets are closed and will work with businesses on deliveries etc. Matt W. mentioned that Dan at Riverside Hardware is designated as the Community Liaison for this project and will have additional project information as it becomes available for the public. This information should also be added to the project website. Leslie Feigel (Chamber) is hanging downtown banners and communicating with KBZK News regarding businesses being open during construction. Patricia Grabow provided copies of meeting minutes from a downtown business owner brainstorming group.